Our time in Taipei was coming to an end but we still hadn’t made the trip out to the North Coast. We kept putting it off because we were bogged down by rainy days almost every day until our departure date. 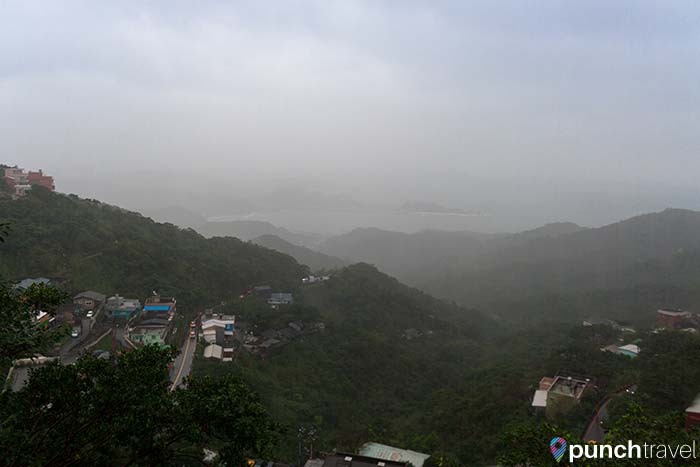 So we decided to bite the bullet and make the journey to Yehliu, Keelung and Jiufen on a day that called for 40% chance of rain. The skies were overcast but not raining when we departed from Taipei. We caught bus 1815 from Zhongxioa Dunhua which heads to Jingmei but stops in Yehliu along the way. 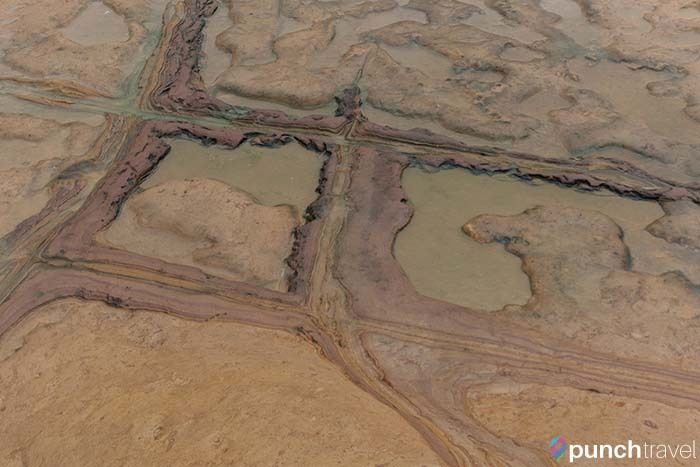 The skies grew darker as we neared the coast…. Ominous. We reached Yehliu about 90 minutes later to a light drizzle. This is a popular tourist route, and the bus driver took care to point us in the right direction down the hill to Yehliu Geopark. 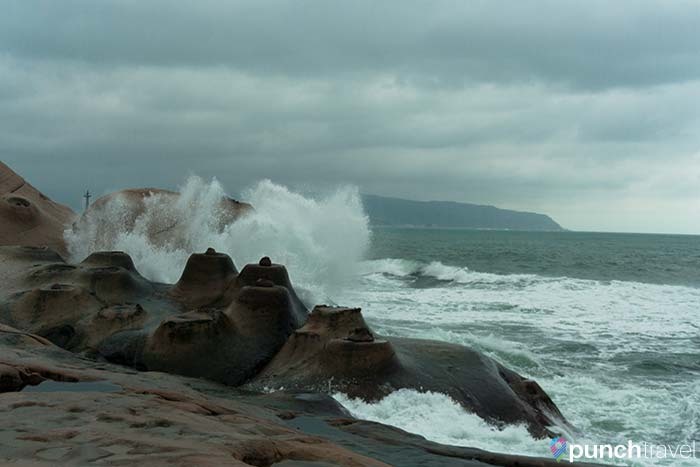 The small town of Wanli, where Yehliu Geopark is located, is primarily a small fishing village. 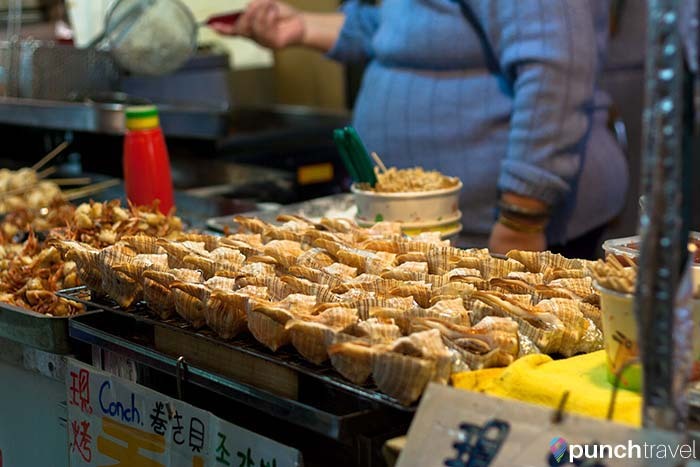 The street is filled with more seafood restaurants than convenience stores. We passed by a port where a group of fishermen were untangling their nets. It seemed like we were walking in the wrong direction. But about 10 minutes later we reached the huge parking lot of Yehliu Geopark. 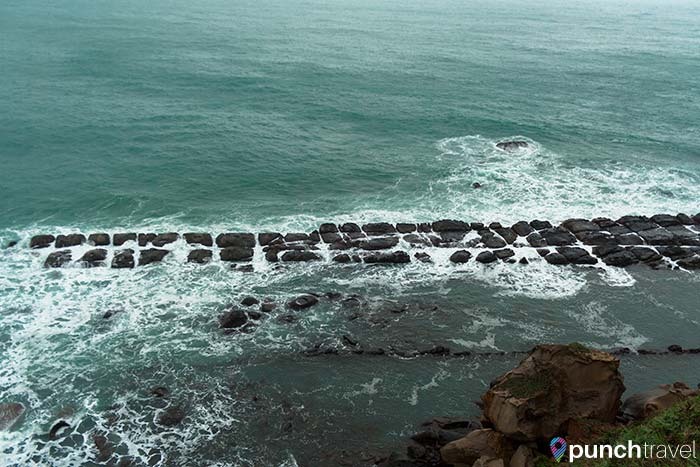 The park spans across a 1,700 meter long cape, jutting out of Taiwan into the East China Sea. By this time the weather was a heavy drizzle. As we neared the shore, the wind began to pick up and waves breached and crashed upon the rocks, making a cocktail of seawater and rain. Umbrellas were flipping every which way and busloads of tourists in bright yellow ponchos huddled together, still taking selfies. Clearly the weather did not deter these dedicated visitors so why should that stop us? We decided to join them, paying our 80 NTD each. 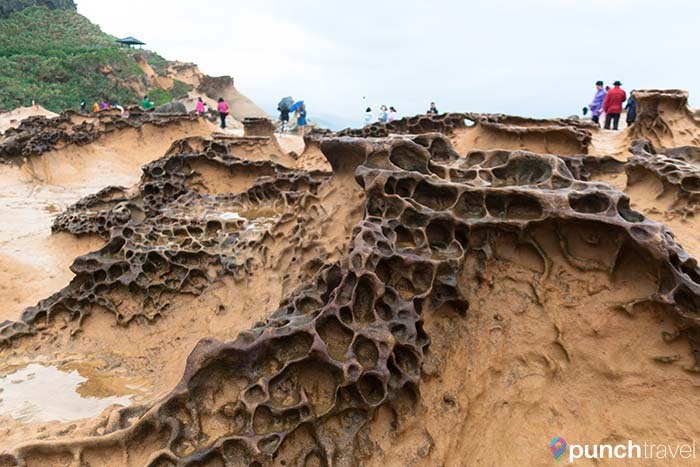 Yehliu Geopark is home to a stunning geological landscape. 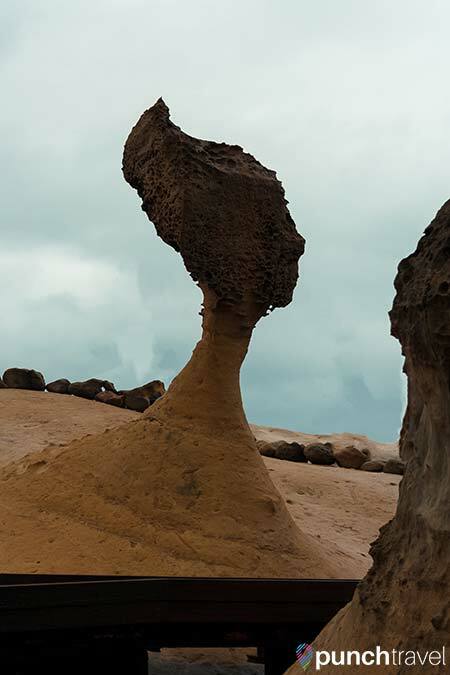 Called hoodoo or tent rocks, this rock layer of the seashore rose during the Miocene period and were eroded by seawater over time. The result is rocks in different unique shapes, nature’s ideal photo-opp. 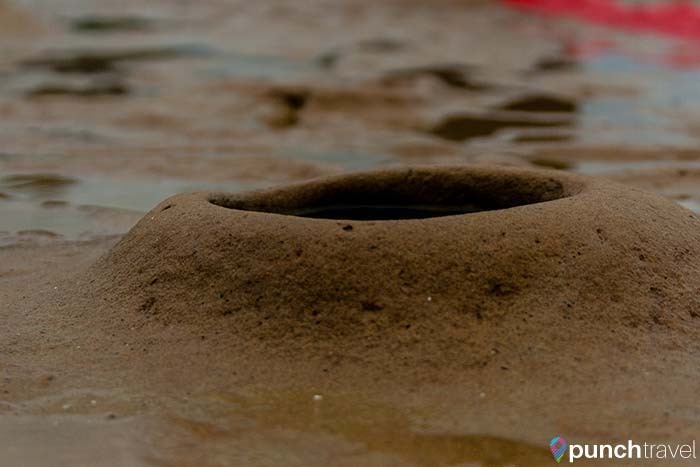 The most unique rocks are called mushroom rocks and attract the most attention. 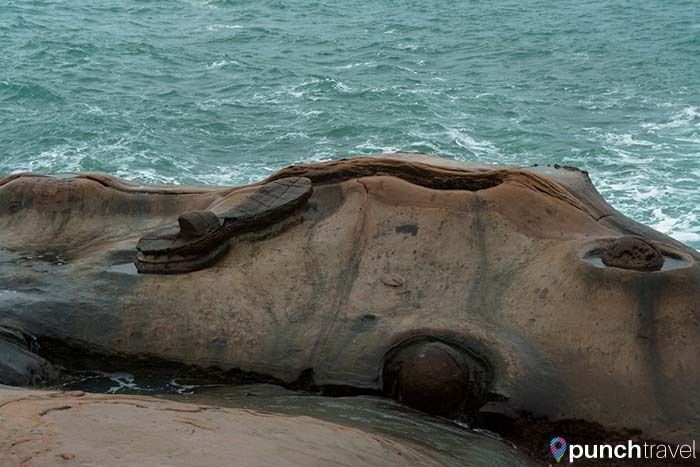 The famous Queen’s Head rock located here has become the symbol of the town of Wanli and a landmark at Yehliu Geopark. Visitors are permitted to climb all over the rocks, which seemed dangerous to both people and nature. It was really cool to see the sand dollar fossils embedded in the rock face. The surface looked like walking on Mars! 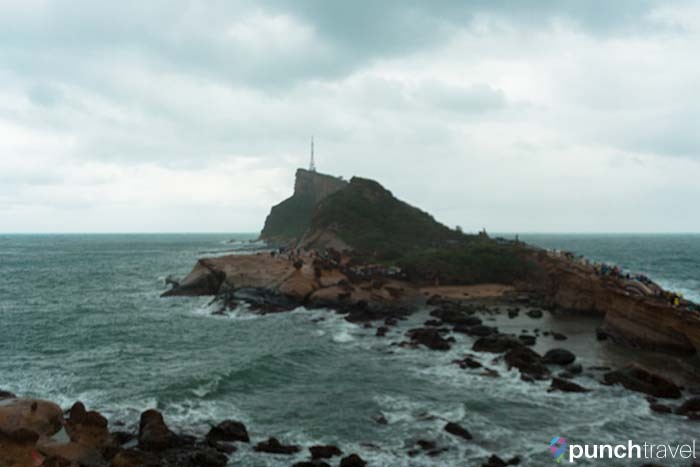 At the tip of the cape is what’s called the 24 filial piety hill, in reference to the Confucian text. Here there is a lighthouse and lookout point. Windswept and wet we exited through a tunnel of stalls selling grilled clam, dried fish and Queen’s Head merchandise. 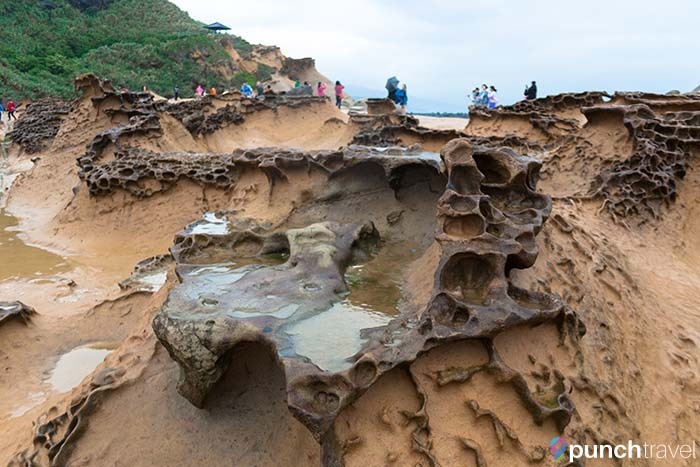 The landscape at Yehliu Geopark was incredibly beautiful – I can only imagine what it would have looked like on a nice day. The rain was still coming down when we left so we were faced with a decision – either call it a day and head back to Taipei or buckle up and follow our original itinerary. By the title of this post, you can probably guess what we chose. Rain be damned, we decided to continue on to Jiufen. To get to Jiufen we had to first get to Keelung and transfer to Jiufen. That meant hopping on bus 790, a local bus to Keelung. 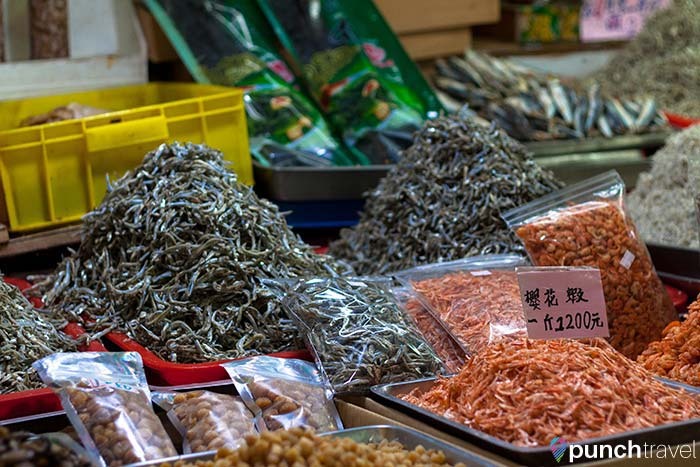 After whipping through the winding roads of the mountainside we arrived in Keelung, home of the famous Miaokow Night Market. We got off at the Keelung Bus Station and crossed the street to take bus 788 to Jiufen. 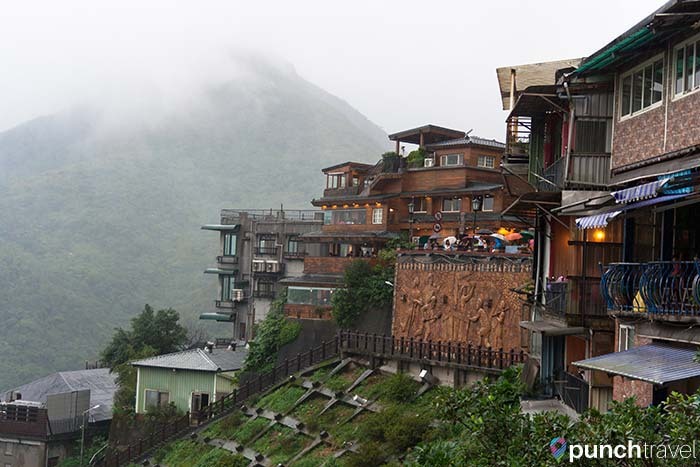 Jiufen is a former gold mining town located high up on a hill. Today the town is filled with historic Chinese and Japanese style cafes and tea houses that dot the hillside. It was amazing that giant coach buses and city buses are able to navigate the tight, winding roads up to Jiufen. We were dropped off at the bus stop amid the commotion of double decker vehicles, scooters, taxis and pedestrians. By the time we arrived, it was now pouring unequivocally. The main attraction in Jiufen is the narrow cobblestone streets that snake up the mountain. Lining either side of the street are quaint shops, restaurants and tea shops. 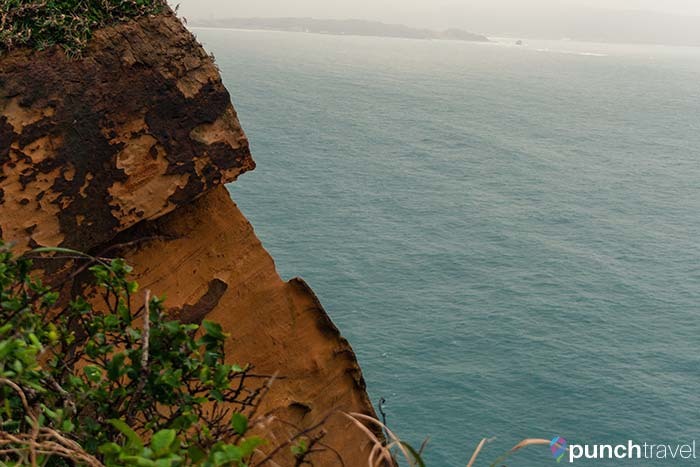 Near the top is a lookout point offering fantastic views of the ocean. I could only imagine how amazing it would be on a clear day. We wandered for a few hours before the wetness was too much to handle. With no signs of the rain letting up, we decided to head back directly to Taipei instead of continuing back to Keelung. But we figured since the main attraction in Keelung was only the night market, we weren’t missing too much. We’ll just have to save it for the next time we visit Taiwan! 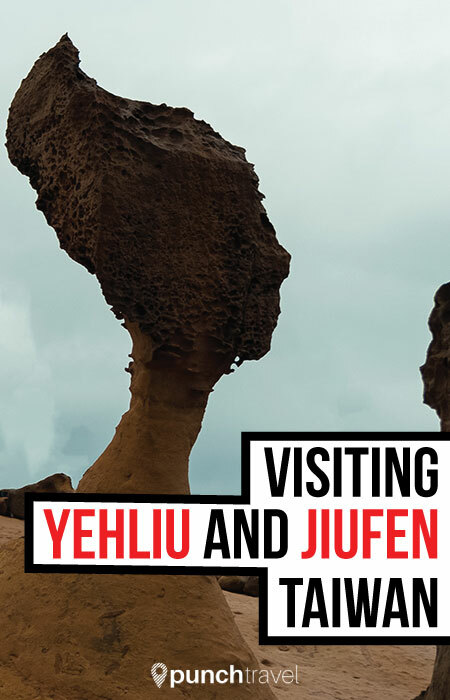 Have you been to Yehliu Geopark? How about Jiufen? What were your favorite things to do? Let us know in the comments!